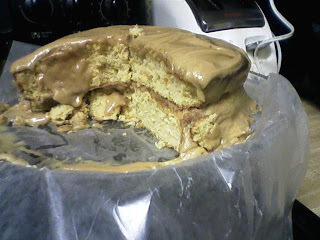 Homemaker Highlights: Peanut butter cake with peanut butter frosting. Peanut butter cake with peanut butter frosting. I know this cake looks very pitiful:) It's actually my fault. I added just a little too much milk in with the frosting mix(I also did not level off the tops) and..well...it started sliding..lol. Honestly, it tasted wonderful and now that I know what I did wrong..I can fix it on the next go around. Before I make a cake for someone or something we are attending, I like to do a practice cake first. Preheat oven to 325*F (160*C). Grease and flour two 9-inch round cake pans. Set aside. For cake, cream together peanut butter and butter until light and fluffy.Add eggs one at time mixing well after each one. Add cake mix alternately with the water; stirring until just combined. Pour batter into prepared pans. Bake for 25 to 30 minutes or until wooden pick inserted in center comes out clean. Allow cakes to cool in pan for 10 minutes on wire rack; turn out onto rack to cool completely. Frost when cool. With an electric mixer, cream together peanut butter and butter until light and fluffy. Add the powdered sugar. Slowly add milk until frosting is at desired spreading consistency. Make one 2-layer (9-inch) cake. The only thing I changed on the recipe was adding milk instead of water in the cake mix. So I am doing another one tomorrow for my dad to take home with him tomorrow night after Lilly's graduation. I hope this time I don't trip with the milk again for the frosting..lol. Due to Lilly graduating tomorrow night and family day being Friday at her school...I will post freebies tonight after we get back from eating with my Inlaws and then I probably will post again Saturday. Oh, also tonight I am going to ask Barry's grandmother how she makes her Peanut butter cakes. She can cook and use to own a restaurant. Ah, I miss eating there...I love places that cook southern cooking. I am curious as to what recipe she uses and I will also try that one if it is different.